At United Service Co., we know what’s best for your walk in freezer. Danvers business owners count on us for a wide range of commercial refrigeration, heating, and cooling services. We’ve been in the industry since 1953 and have served hundreds of establishments throughout New England. Our family owned company wants to optimize walk in coolers and freezers in all types of applications. Whether you need a freezer installation, affordable repairs, preventative maintenance, or emergency services, we’re your go-to technicians. 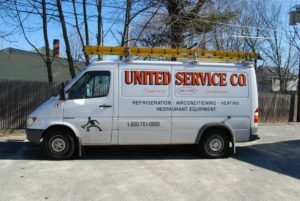 Get to know United Service Co.
How is Your Walk In Freezer in Danvers Doing? System inspections. Our knowledgeable technicians come to your property on a preapproved maintenance schedule. Our inspections are free, and we’ll give you a price quote for any preventative maintenance we deem necessary. We’ll assess your walk in freezer and other refrigeration components, as well as cooking equipment and your heating and cooling system. We are a full-service company that can inspect, troubleshoot, and repair almost any type of commercial equipment. Health and safety standard assessments. With more than 100 years of combined experience in the industry, our team knows what will and will not pass safety inspection checks. For instance, the ice machine is often the first piece of equipment to get a health and safety demerit. United Service Co. can optimize your equipment, clean components, and keep things in proper working order to help you pass inspections and uphold your reputation in the community. Minor repairs. One of the best things about preventative maintenance for your walk in freezer in Danvers is the ability to catch small problems before they cause or turn into major issues. Our technicians can detect small issues with your freezer and conduct repairs, saving you money on total breakdowns in the future. Maintenance can give you peace of mind, help you avoid emergency situations, and avoid business interruptions. Walk in freezer optimization. Routine maintenance does more than just prevent breakdowns – it makes small improvements to your system for all-around better performance. Lubricating components, replacing worn parts, and checking coolant levels can all keep your cooler in optimal working condition. This means more efficient and reliable cooling, lower energy bills, and quality assurance. Replacement and new installation recommendations. No freezer will last forever. Sometimes it makes more sense to purchase a new walk in freezer instead of paying for expensive repairs. If your system is old, outdated, or inefficient, we might recommend replacement during our preventative maintenance check. You can purchase models from top brands through United Service Co. or design and build a custom walk in. Full restaurant equipment check. Our team specializes in more than just your walk in freezer in Danvers – we also service restaurant equipment, coolers, ice machines, and HVAC systems. During a maintenance check, we assess all your appliances and commercial equipment to make sure everything is operating as it should. When we leave your establishment, you’ll have total confidence in the functionality of your most important systems. While commercial units can perform well on their own for a while, these complex pieces of equipment require occasional maintenance checks to ensure they operate at maximum efficiency at all times. Otherwise, you could face higher energy bills, expensive leaks, and harmful breakdowns. Our maintenance program is one of the best ways to ensure the health of your walk in freezer in Danvers. At United Service Co., we know commercial refrigeration systems aren’t always one size fits all. Sometimes a restaurant, brewery, hospital, or food processing plant needs custom-tailored cooling and freezing solutions. That’s why we’ve partnered with U.S. Cooler to offer custom-designed walk ins in New England. You can personalize your walk in freezer in Danvers from top to bottom with exact size and freezing specifications for your individual needs. There is no walk in freezer we can’t design. U.S. Cooler creates custom systems for convenience stores, warehouses, restaurants, bars, grocery stores, game lockers, florists, mortuaries, and other establishments. They are a trusted source for modern, energy-efficient coolers and freezers. With their help, United Service Co. can accommodate the unique needs of each customer. If we don’t have the right walk in freezer in our catalog, consider designing your own. A custom design gives you total freedom to decide the size, shape, and capabilities of your system. Our trained technicians will help you design the ideal freezer and build it according to your blueprints. You’ll have a totally unique walk in freezer in Danvers in no time. Off-the-shelf walk in freezers aren’t right for every establishment. Some need customized options to suit specific requests and requirements. Our team can create small- to medium-sized walk in freezers and large industrial appliances. We can build a reach-in freezer or one large enough to accommodate forklifts dropping off pallets. Tell us what product(s) you wish to freeze, and we’ll create a result that delivers the quality and performance you require. Contact us for a custom walk in freezer price quote. Your walk in freezer in Danvers can’t take care of itself. Occasionally, you need professional technicians to inspect and repair your system. When that time arrives, come to United Service Co. We have the expertise and capabilities necessary to accommodate virtually any commercial refrigeration need. We want to help you keep your walk in freezer in Danvers in proper working order for as long as possible. Services through our company can extend the life of your unit and give you the best returns for your investment. With a long history of customer satisfaction, an A+ Better Business Bureau rating, and outstanding reviews, United Service Co. has the credentials to make you confident in our services. From preventative maintenance to new installations and custom builds, we do it all. Join our long list of happy customers. Call (800) 761-0900 to schedule services for your walk in freezer, Danvers.